Today is the first day since Saturday I’ve really had time to sit down and write, but Saturday seems a long way away now. A rainy morning had turned into a sunny afternoon when Emma and I met to check our five (five!!!) hives. We are trying to inspect more quickly recently, both because we have more frames to inspect and because we hope if we keep the hives open for less time ultimately the bees might do better and we’ll get more honey. This is tricky as obviously at the apiary beginners are often watching; they want to try inspecting for themselves and have plenty of questions to ask. This is good and I enjoy answering the questions, but at the same time we need to balance their needs with the wellbeing of our bees, plus our own desire to enjoy the beekeeping we do. One of our queens – not sure which! Luckily our five hives weren’t particularly naughty this week. 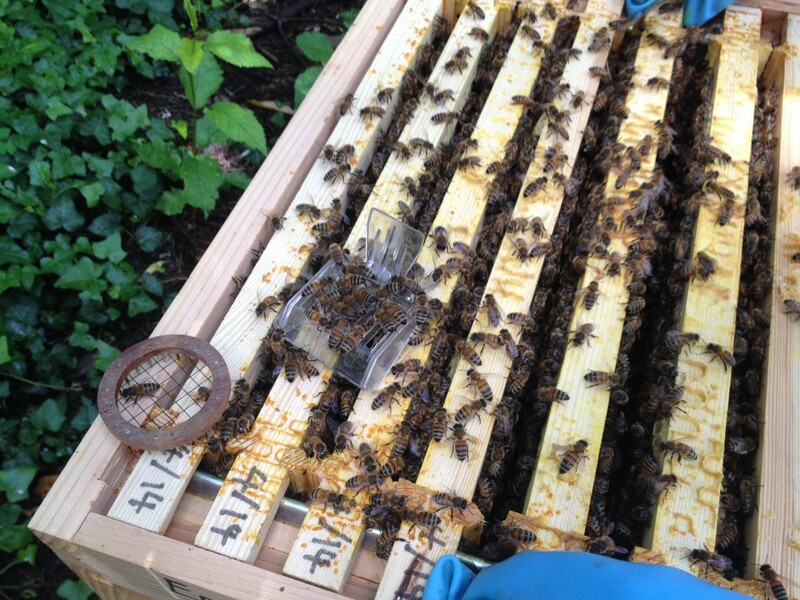 We have been feeding over the last fortnight as the June forage gap hit London; also the hives had been weakened after Chamomile and Chilli’s colonies were split when they produced queen cells. Obviously we would rather not have to feed sugar syrup – it’s a lot of work to keep making it up! – but eating syrup is better for the bees than eating nothing. As Emma said to a beginner who commented “I’ve read that feeding syrup is bad for bees?” – well, starving is bad for bees too. 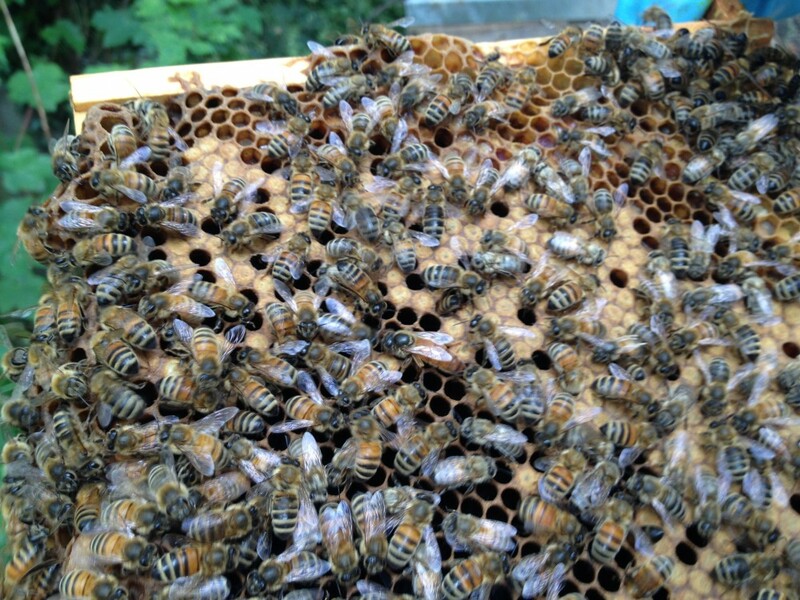 In the photo above we had put one of our queens in a cage in case we needed to do anything with her later, for instance if we had found any queen cells whilst inspecting the colony we might have wanted to do an artificial swarm and split the hive. I liked how quickly the bees surrounded the cage, drawn to her pheromones as if engaged in a rescue attempt. We managed to inspect all five colonies with only one sting received, which was caused when I accidentally squashed one, so my fault. Myrtle’s ladies continue to be the sweetest bees on the planet, while Chamomile’s and Chilli’s are rather more feisty. It’s too soon to say what the two new colonies created by the artificial swarms will be like in temperament. Although we’ve spotted a new queen in both, neither queen is laying yet. We are giving them a couple more weeks to prove themselves. Of course, there is a sixth hive too. 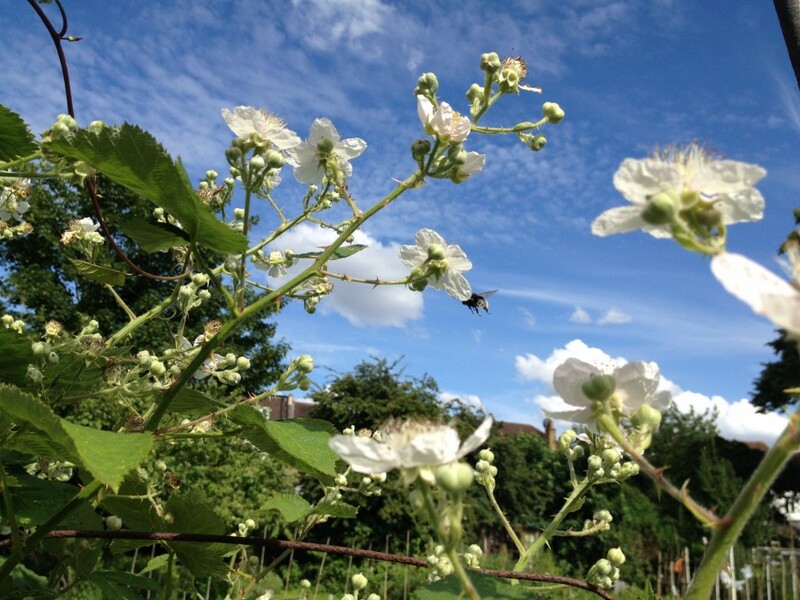 All is going well at the allotment apiary. I enjoy how easy it is to ride my bike there, my equipment in my basket. The bees there are fairly low on stores too, but luckily not so low they need feeding. As this hive is all my own now rather than shared with Emma, I’ve decided to name the queen after my favourite great aunt, who passed away a few years ago. She will be Queen Stella. Queen Stella’s bees display a remarkable behaviour that I’ve seen two weeks running now and previously had never seen before in our hives. It’s the DVAV (dorsoventral abdominal vibrating dance). When I was revising for my Module 6 exam on honeybee behaviour, I learnt that this is believed to be ‘get a move on’ message. A worker will mount or grab another bee and vibrate their abdomen on top of her. It’s used to recruit more foragers during a nectar flow and also on queens just before a swarm exits the nest. As the colony was low on stores, perhaps Queen Stella’s bees felt it was about time some foragers went out shopping. I saw a few of them going around, grabbing other workers and vibrating them for a second, then letting go and moving on. I tried to discern some pattern to which bees they chose to vibrate, but all the bees looked the same to me. 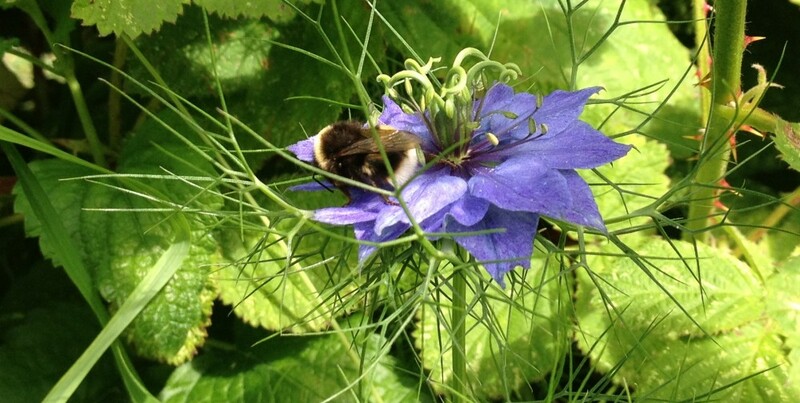 In reality perhaps they were choosing to buzz older foraging bees rather than younger nurse bees. 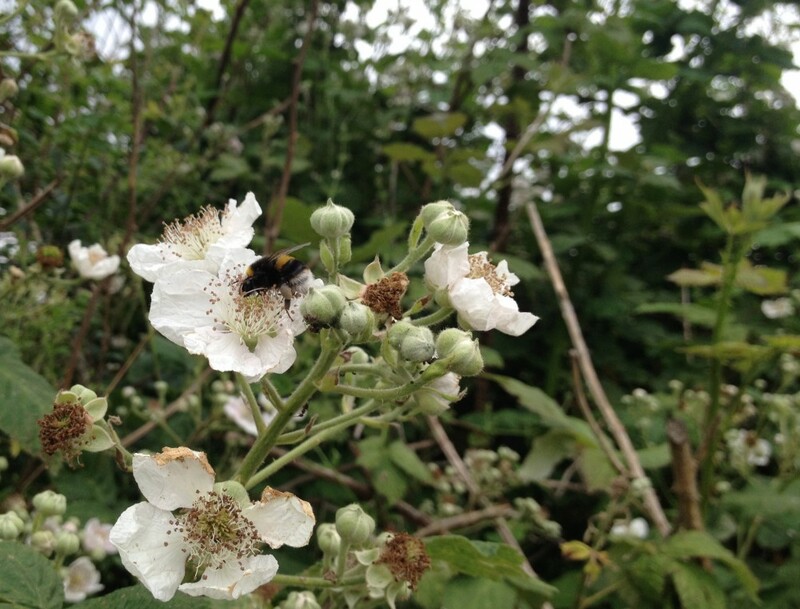 I’ll leave you with a few photos of bees and flowers I took around the allotment. This entry was posted in Uncategorized and tagged bees on flowers, dances. Bookmark the permalink. Good Luck with the five hives. A nice honeymoon present…far better than returning to bees that swarmed away! John likes to make sugar water in my big stock pot and then when I go to make a big pot of soup or chili I find it full of sugar water! He keeps a supply on hand rather than make a batch every hive visit. Are you going to get your new hubby involved with the bees or does he have to just tolerate your obsession? I thought it was a nice honeymoon present too! How kind of John to make up sugar water. Drew comes to take photos of the bees sometimes – he’s very brave and doesn’t wear any protection – but mostly he leaves me to it. He has his own hobbies, mostly involving cycling and computer games! Since John is the actual beekeeper and I’m his sidekick, the sugar water is his thing. Plus, he likes to fuss in the kitchen. Drew will come around…the bees are too interesting not to! I like when you comment that it’s your own fault you got stung. I was working with a beekeeper recently who obviously received several stings. I asked him how many times he’d been stung and he replied, “none”. I guffawed and he said, “well, the only times they stung me were when I deserved it by squishing them so that doesn’t count”. It’s a good attitude to have, if not entirely honest. It certainly hurts just as much when you get stung by accident! But it is gratifying that at least the bee didn’t do it on purpose, though that in turn brings guilt that it’s your fault! You’ve mentioned putting your queen in a cage. How did you find her among thousand of bees, especially when she is un-marked? I know what a queen looks like but can’t seem to find her in hives that I captured swarms in. I know she’s in there as the swarm doesn’t leave. Would you have any hints I could use? Finding her is mostly luck. Our colonies are small at the moment following artificial swarms, so the queen is easier to find. Most of the time I try to look for eggs rather than the queen, spotting her is just a nice bonus. If you really need to find her, one thing you can try is removing a few frames you are positive she’s not on, containing mostly honey stores instead of brood so the larvae don’t get chilled. Use the extra space to arrange the remaining frames into pairs, with gaps between each pair. The queen will probably attracted to the darker space in the middle of one of the pair of frames. Working with a partner, take it in turns to check the frames one by one, making sure to hold the frames over the brood box whilst checking. If you’re really desperate to find her, another method is to shake all the bees through a queen excluder, as only the queen and drones won’t fit through. But obviously that’s very disruptive for the colony. Finding a queen can be an art. Don’t try to look at every bee. Instead slowly scan a section of the comb looking for something different. Either the longer body of the queen or the way she moves differently! After a spotting queens a few times it becomes easier. I tend to mark most of my queens when possible as of course that makes finding them in a strong colony easier and faster when I need to! Thanks 🙂 Love your blog. Lucky you living in Macedonia, must be lots of wildlife to see. 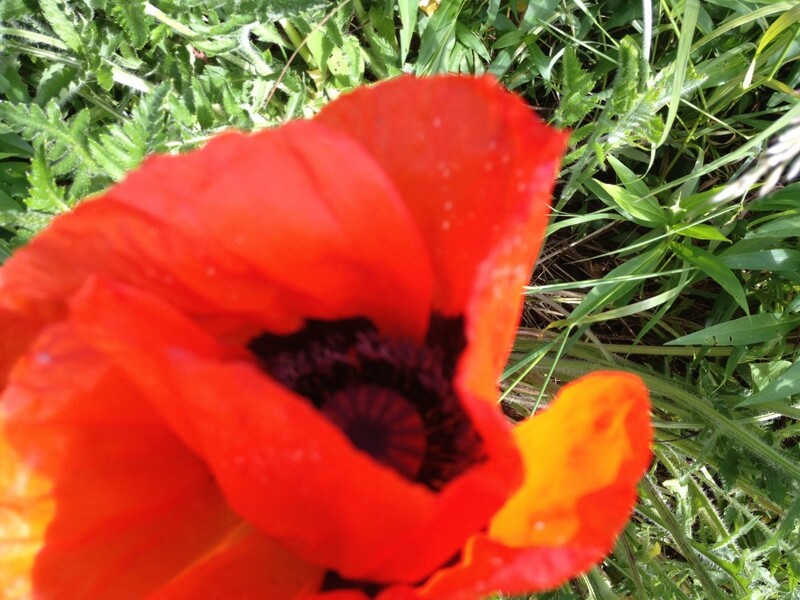 I’ve not been there but have visited Albania and Greece, loved all the wildflowers of Albania. 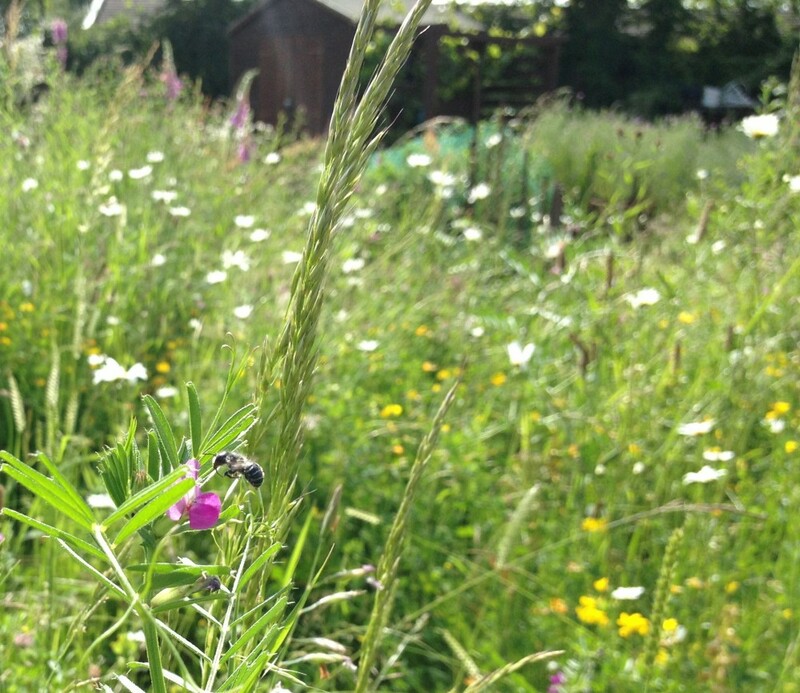 Emily, what a lovely vision of the beeyard in summer! 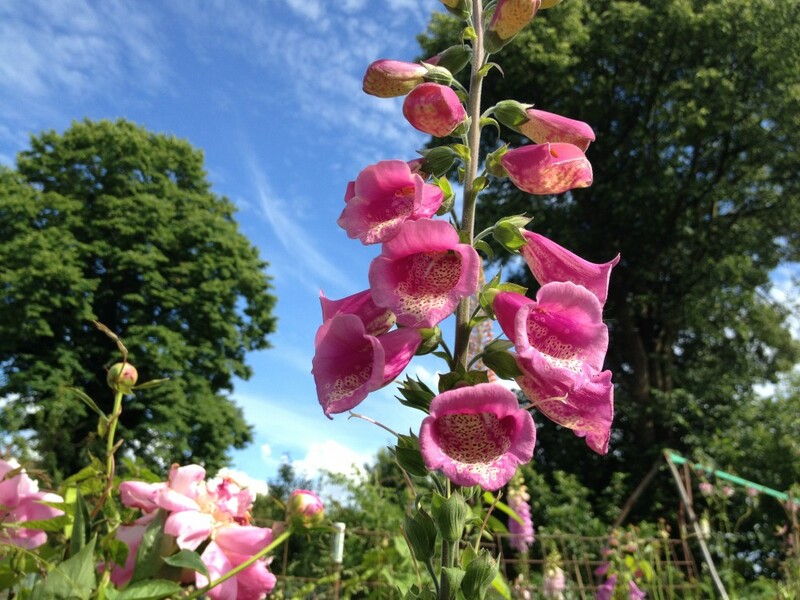 I think 5 hives is a great number…enough that you are going to see different things and learn so much more. And more inspection time = more confidence going forward. Let us all know how your new queens come along! Thanks! To be honest we’re finding five hives a bit overwhelming… probably because they’re not in our back garden, but a fairly long journey away, so inspections need to be done all at once. At some point we’ll probably either combine some hives or sell some off. Glad that you had a memorable honeymoon and thank you for the pictures. 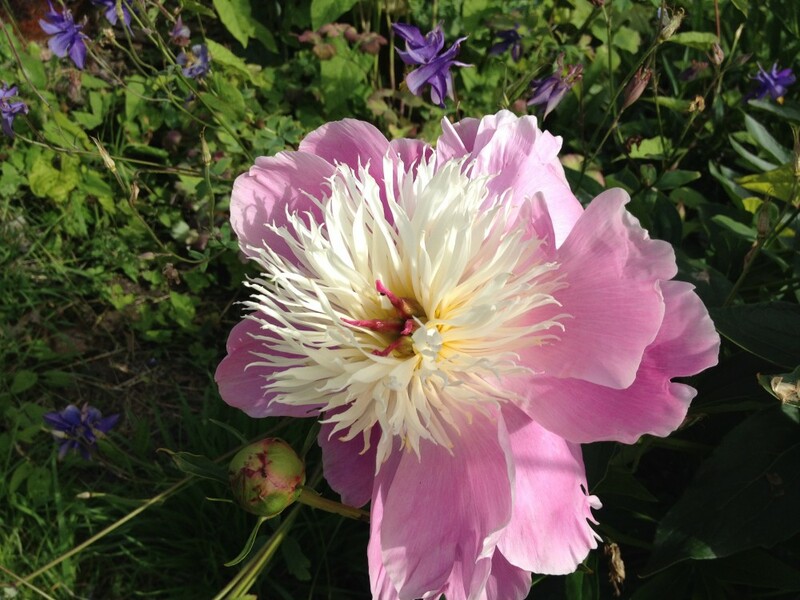 The pink flower in your last post appears to be a rather beautiful and exotic Peony judging by the bud behind. Thanks 🙂 Glad to find out it’s a peony, I hadn’t realised. It’s amazing what some of the allotment holders have achieved, they look like entries in the Chelsea Flower Show. Thanks Em, but really Tom should take the credit, he strimmed it down and put up the gate and netting! Hello there…I was just wondering – why the netting? Is it to encourage the bees to fly up over a path, or just to keep people away? Is it that green ‘windbreak’ netting…? Thanks for all the info and lovely photos! Hello! 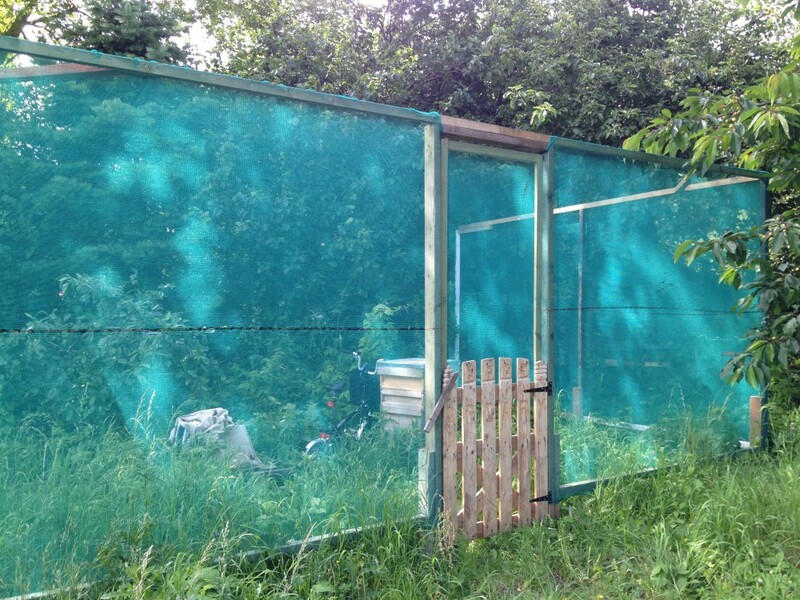 The netting is partly to encourage the bees to fly up and over the nearby allotments, over head height, and partly to discourage people from getting close.